I came across this quote on Instagram recently, and liked the sentiment. I’ll admit I had to Google Elsa Schiaparelli (an Italian fashion designer, apparently) but I like her approach. Eating can become a battleground of sorts: a battle to eat well when really you want to surrender to the biscuit jar, a struggle to maintain good habits and look after yourself when time is hard to come by, and fighting against the constant clamour of pseudo-science to avoid fads and just eat simple, wholesome and tasty food. That’s a lot of conflict, so it’s nice to think of the friendlier side of food too. Food as a friend, as comfort and nourishment and fun. For me, food is often a social or leisure kind of thing, a way to recharge, find some head space or share some good company. On my own, cooking away with a podcast on, grabbing a quick bite at lunch time on a busy work day to clear my head, meeting friends for a meal, or simply tea, cake and chats. 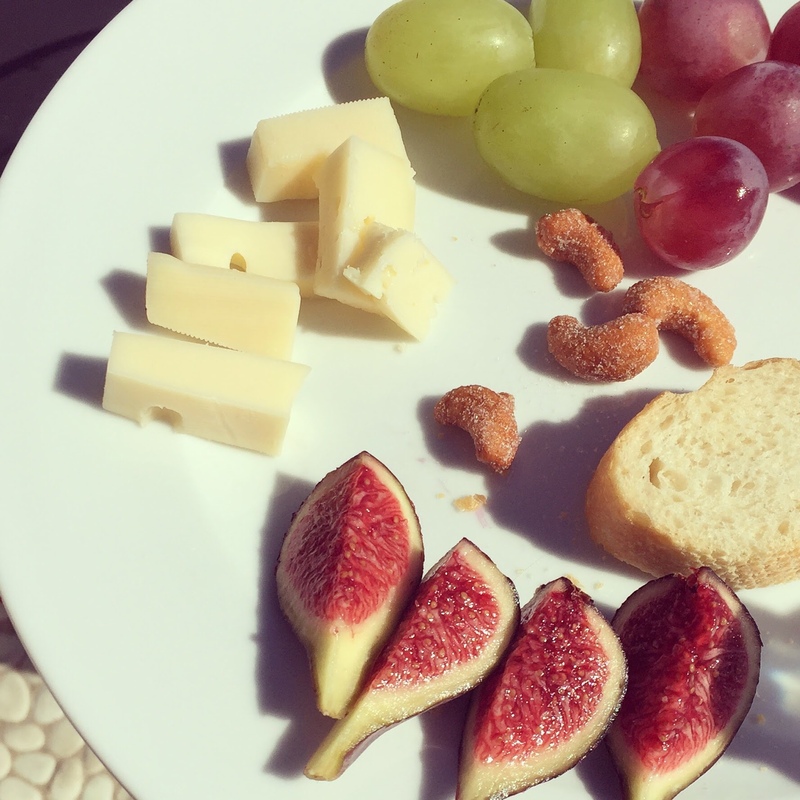 A recent holiday in Spain featured lovely, lazy balcony afternoons with snacks (amazing fresh figs, nuts and other tasty bits) and good company. Fast forward a few weeks to a Saturday night in with friends, and lots of delicious nibbles, including olives, cheese, and juicy red grapes. It’s the simplest things that can make us happy really, isn’t it? We all have days when we are zipping from A to B, with a to-do list a mile long and people pulling us in multiple directions. Those are days that usually call for a Double Decker for me. And sometimes that’s exactly what you need. 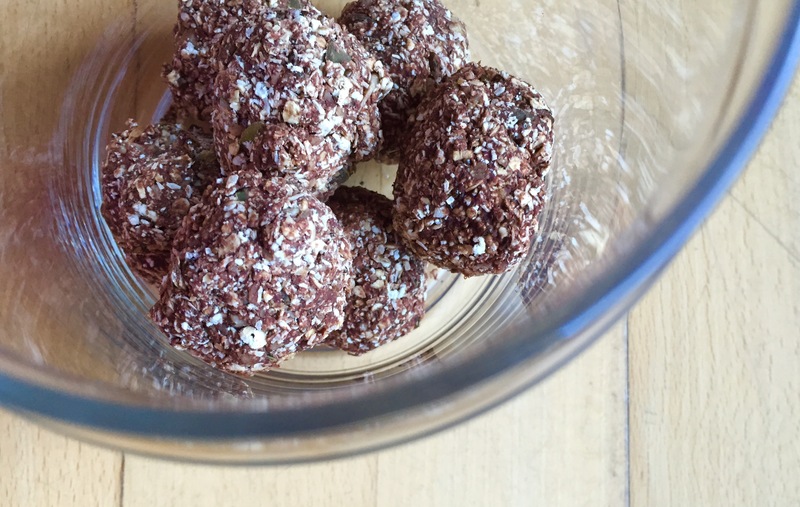 However, I recently spotted a recipe for energy balls that I thought might be a tasty alternative and a good way to give me a boost on the go. This recipe features lots of things I love, including oats, banana and coconut, so I was hopeful that these snacks would be right up my street. The recipe also uses raw cacoa, something I have never used before. As far as I understand, it’s basically unprocessed cocoa. A lot more expensive than regular cocoa powder, but I decided to give it a try once anyway! After blending all the ingredients, roll the mixture into balls and bake in the oven for 5 to 8 minutes. Allow to cool before munching. These were very easy to make, but to be honest not as tasty as I’d hoped. Not a bad flavour, but possibly a little dry. I might add dates next time or some sort of dried fruit, for a bit more stickiness. So, all in all, unlikely to replace my Double Decker just yet! Have any of you had success with energy ball recipes? I like the idea of nutritious, portable snacks, but they need to be tasty – not just virtuous! Share your recipes via a comment. Thanks! It’s a bit miserable out today, a bit damp and grey, and well…January-ish. On such days, I’m usually far more susceptible to the lure of tea and biscuits, accompanied by a ‘straight-to-TV’ film or a flick of a magazine. A few weeks ago I watched a documentary on sugar, which quite frankly terrified me and was far more effective than any January health kick in motivating me to step away from the biscuit tin. That said though, life would be terribly dull without a few treats. So my current approach is to at least try to opt for homemade ones where I can control the sugar and other ingredients. I’ve been meaning to try The Little Green Spoon blog’s pistachio and cranberry squares for the last couple of weeks. These were really simple to make, and quick too (an added bonus!). In summary, lightly toast oats and pistachios. Blitz these with coconut and cranberry, and then bind with melted coconut oil, almond butter and maple syrup. I reduced the amount of maple syrup slightly, and I’d imagine you could use another oil or melted butter instead of coconut oil, depending on what you have to hand. If you happen to be into icing cakes, and have an icing smoother, it comes in very handy for squishing the mixture into a baking tray to set. If not, your hand or a sideways mug (hold by the handle and roll) will also do the trick. The recipe I was working from yielded 12 perfect squares. My attempt was a bit crumblier…so broke a little when I cut it into pieces. Still tasty, just a bit misshapen (and the leftover crumbs were delicious sprinkled into yogurt). Over the last few months, an endless stream of chocolate digestives have found their way to our apartment and have been subsequently devoured. This daily biscuit habit (usually actually daily biscuits!) 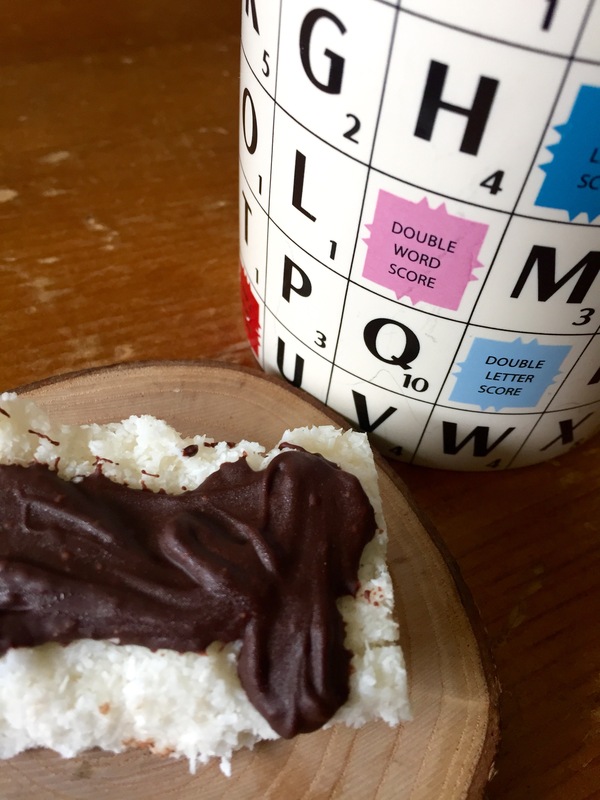 is one that we are trying to put an end to, but I’m still partial to a little evening treat. I try to eat reasonably healthy meals, but it is what happens in between meals that is the problem. A packet of biscuits hasn’t a hope. A box of sweets is a goner, and an open bag of crisps will meet a fast end. I’m a snack fiend. 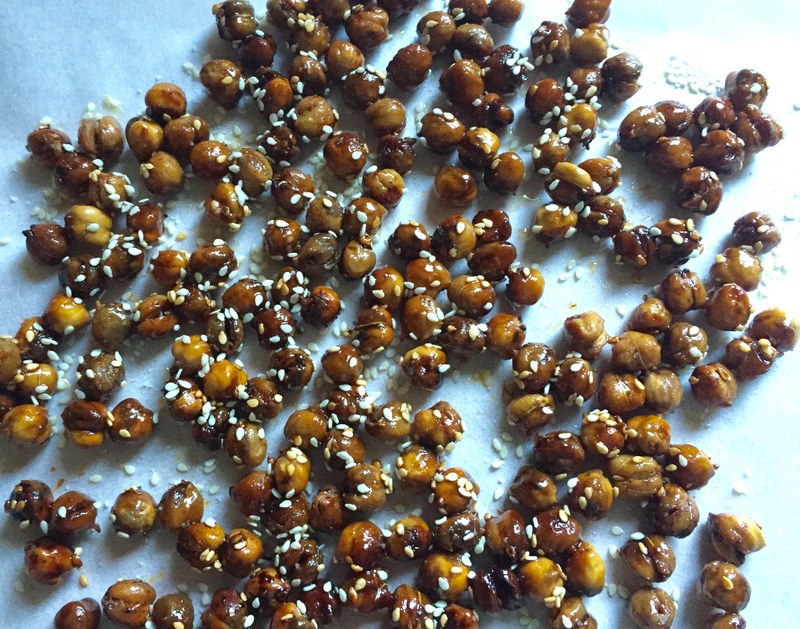 I’ve tried vegetable crisps but they aren’t really my thing, so when I came across a recipe for crispy chickpeas with honey, salt and sesame seeds, I thought I might have found my healthy-ish snack of choice. These little bites deliver a nice crunch, and are a lot more satisfying as a snack than I had expected. They would make a nice addition to a salad too, replacing croutons for example. When it comes to snacks, I find choosing is the hardest part. I’ve a very sweet tooth, and an inability to step away from a packet of biscuits. Crisps I enjoy, but very rarely crave. But dry roasted, salty nuts: that’s another story. Recently, I’ve been nibbling on honey cashews a lot. I decided to have a go at making some with a twist – adding salt. To get the proportions right, I turned to Google for a recipe, and came across this one. 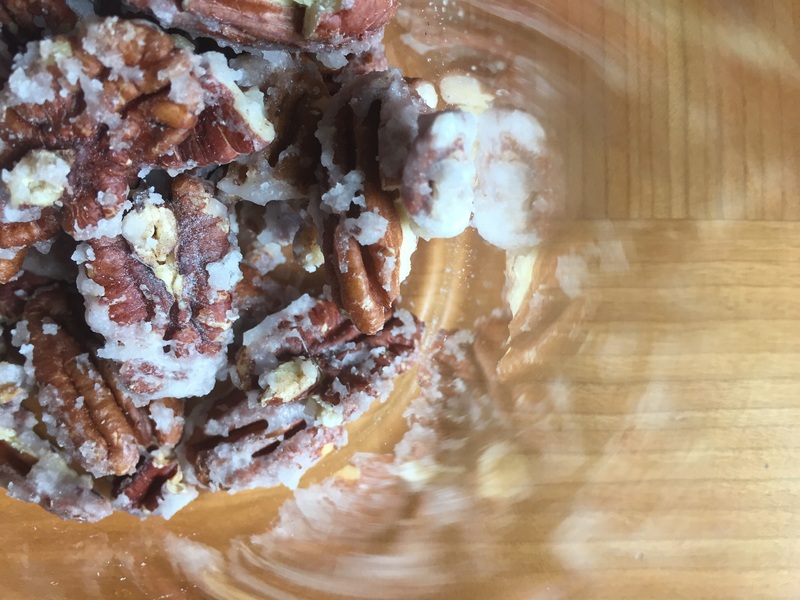 I opted for just pecans rather than mixed nuts, and left out the vanilla extract. Easy to make, and delicious. A great treat, and also a nice topping for ice-cream or for decorating cupcakes. Summer skies, long evenings…it really does put a smile on your face. Lunch at the moment means just one thing: picnic. On sunny days what I bring to work for lunch is dictated by what lends itself to being eaten from a plastic tub in a bright patch of city centre green space. I love nabbing a few minutes outside at lunch, away from my basement office. Even 20 minutes listening to a podcast and solo nibbling on my picnic in the park is enough to leave me feeling full of vim and vigour for the rest of the day. Mackerel pate (more of a paste really!) is a handy mid-week lunch option as it is cheap, quick and fuss-free. Whip up a batch and it keeps in the fridge for a few days. There are only four, or at a push, five, ingredients, and it takes about three minutes to prepare. Peel the skin off the mackerel, and put the fish and all the other ingredients in a blender and blitz until smooth. Add it to a salad or spread it on crackers or bread (I love it on homemade brown bread). I’ve yet to try it, but reckon this recipe would work work well with salmon or tuna instead of mackerel, if you prefer.